Do you own one of those private homes that have a gate at the entrance? Then you probably feel safe and you have created an intimate environment for your family to live in. but what about comfort? If you have to get out of the car every time you arrive home and open the gate, it is probably time for an upgrade. We all know that besides being uncomfortable to open and close the gate manually every single time, it gets even worse when the weather is unfriendly. Gate openers are devices that help you automatize your gate. Entering and exiting your property becomes a lot more convenient when you have such a device installed. The great thing about these devices is that they can be operated from a considerable distance. Some of the available models on today’s market can even be programmed. If you are tired of physically opening the gate whenever you leave home or you arrive after a long day, then this is the best option for you. More than that, using a simple device such as a gate opener, you will make your property look modern and fancy. Those who think about automatic gates but aren’t convinced that it’s the best idea, mostly fear that there aren’t enough safety features embedded in these devices. What if someone gets caught up in between the gates? What if it hits the car unexpectedly? These are some of the questions of those who have probably seen such incidents happen in the past. Luckily, gate openers have been improved in such a way, that they come with advanced safety features, remote controls and various options for power sources. If you are eager to increase your property’s comfort and to create a modern setup, then you should check out the five best-selling gate openers that the market has to offer. We have selected the most popular options on the market and highlighted their pros and cons for you. See which one suits your needs best. When looking for solutions to automate your property’s gate, you probably think that it is better to choose the products of specialized manufacturers. We definitely encourage that, especially because they tend to focus on quality, performance and high-end tech. 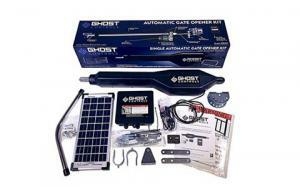 Ghost Control does exactly that and the TSS1XP model, which is a single gate kit, comes with a silent motor, high-quality mechanics and a great electronic design. Also, it responds quickly to your commands, so you won’t have to waste any time waiting for the device to do its job. Thanks to the strong construction of its motor, it can last a life time. Installing it is really easy and you can do it yourself. The great thing about it is that it includes a 10W solar panel, so that you can save energy. However, it also works on a 12V battery, which is not included, but it will not be a large extra-investment. This product was optimized for tube gates and it is compatible with all sorts of gates such as decorative, chain link or plantation gates. Although this is an amazing product that is easy to use and that is certified, it also has a downside: it doesn’t include the AXPO push-to-open brackets, which is quite essential. You will have to buy this one separately. 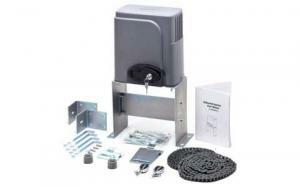 If you are looking for a single gate opener that comes with extended warranty and that does the job perfectly, then you might like US Automatic’s product. This is an extremely reliable model that comes with a strong motor, high-quality materials and solar charging. When using such a gate opener, you get to save a lot of energy, as it is powered by a 12 VDC battery and a solar panel. It includes two remote controls and it can be operated from a distance up to 20 feet. It comes with universal mounting brackets, so that you can use it on most gate installations. This product is designed to be used with swing gates from class I, II, III and IV. However, the gate’s weight should not exceed 400 pounds in order for the device to work properly. It is compatible with ornamental iron gates, ranch gates, farm gates and chain link gates. This model has a gate bracket, a linear actuator installed level and a universal actuator bracket. By comparison with the previous product, this one also includes mounting brackets that you can use for a pull-to-open or push-to-open operation, depending on your needs. Its slightly higher price isn’t the only thing that proves its high-quality and durability, but it 3-years warranty, too. If you have set a budget that doesn’t allow you to invest a fortune into a gate opener, then here’s a more affordable option that is equally practical. 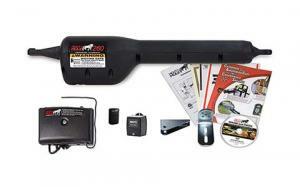 This is an inexpensive slide gate opener that can be controlled from 100 feet away. It is made of stainless steel, it includes the RF hopping code technology to protect the remote controls from strangers and it can open gates that weigh up to 1400 pounds. However, the gate shouldn’t be longer than 40 feet in order for the device to work properly. This model comes with two remote controls that work on a 433.92 MHz frequency. Although it includes only two of them, it can be connected to another 23. Besides the two remote controls that allow you to open and close a sliding gate easily, the package also includes two manual release keys. This key’s purpose is to help you open the gate in case of power outage. The box also includes all the necessary mounting hardware, 20ft of chain and any installation parts that you might need. It has to be connected to a 100V AC power supply and it uses an output power of 200 W. The speed of this device’s movement is 43ft/min or 8.5 inches/second. Its motor’s speed is 55 RPM, while the noise it makes is under 56 decibels. Yet another inexpensive device for gate opening operations is brought to you by Mighty Mule, a manufacturer that focuses on security. This isn’t an actual gate opener, but a lock that works with Mighty Mule automatic devices. If your property gate is heavier than the average and you would like to buy a product that can support its weight, here’s your best option. 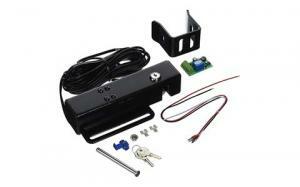 This gate opener works on gates that weigh up to 2500 pounds, under safe conditions. There is a huge difference between its weight, which is only 6 pounds, and the weight that it can support, which makes it incredibly durable. It measures 13 x 8 x 3 inches and it is compatible to a variety of gate types. The FMI43 model is easy to install, you can do it yourself by simply following the instructions and can be used with the same remote control that you use for your gate opener. There is no need for a second one, which makes it quite practical. The fact that you can lock your gate automatically makes your life a lot easier, especially if you can’t get rid of the anxiety caused by not remembering if you closed it or not. This products runs on batteries and you will need for of them (AA). The batteries are not included in the box. A medium-priced gate opener from Mighty Mule is probably what you need if you don’t want to invest in a fancy, high-end device. This product is a single gate opener that meets UL325 standards. It is the ideal product for you if you have a property gate that doesn’t exceed 300 pounds and isn’t longer than 12 feet. Due to the fact that it is designed to handle lightweight gates, you might want to check out the specifications of your gate first. Although it has this limitation, it also has a lot of great features. More importantly, you don’t have to hire a contractor to install it for you, as you can do it yourself with the help of its included instructions. To make it even easier for you, Mighty Mule even included an installation DVD. Also, they have 24h technical support available. The MM260 is compatible with chain link, tube, panel vinyl and wood gates, so you don’t have to worry about the materials, as long as they don’t exceed the recommended weight. This product comes with a single button remote control, an AC transformer, a control box and all the necessary mounting hardware. It requires a 12V battery that can produce at least 250 cranking amps. It is also solar capable, yet the panel that it includes is quite weak (5-watts). The main difference between modern and older gate opener models is that they are much more silent, easy to install and use. There are models that work using only solar panels or batteries. They come with motors and gears that are really easy to assembly, which makes installing them extremely easy. When looking for the best gate opener, you will observe that there are dual gate kits, as well as single gate kits available, so you can choose the best option for your needs. Going for one of the advanced gate openers is a choice that comes with a lot of perks. For instance, some of the models in our list feature a vacation mode, party mode and other useful options. Others are more basic and therefore, cheaper. Depending on what your preferences are, you can surely find the best gate opener based on the results that you want to achieve. Check the five products above to see which gate opener is better for your property.